Music star, Davido has signed a new artiste, Idowest to his record label Davido Music Worldwide (DMV). The singer revealed the newest addition to DMW on his social media page. Idowest has released his singles -Handkerchief, Omo Shepeteri, Shepeteri ft Slimcase, Eko and lepa Gau which have made waves in the entertainment industry. He also featured in Mr Real’s hit song ‘Legbegbe’. The street sensation was also nominated amongst artistes like Small doctor, CDQ, and Skuki for The 2018 Headies Award for Best Street-Hop artiste. 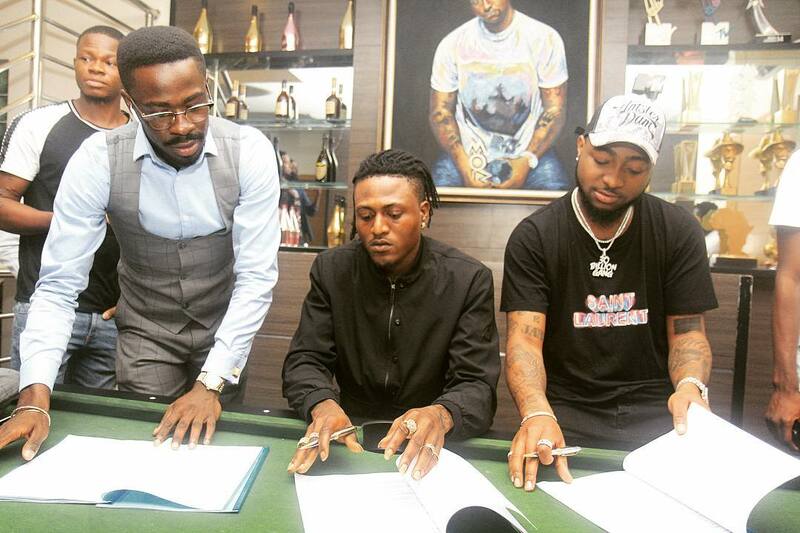 Davido revealed the news of the latest addition to DMW on his Instagram page, sharing a photo of the artist signing the contract. The record label DMV has many artistes signed to the music family, like Mayorkun, Dremo, Ichaba, Peruzzi, Yonda and the newest member Idowest. Idowest has been of one the artistes that has enjoyed massive support from fans this year his music career has been a huge success since dropping his hit single “Shepeteri” in October 2017. With the huge success of his hit song ‘Shepeteri’ one can tell that the young man is talented and will surely go places with the right team around.